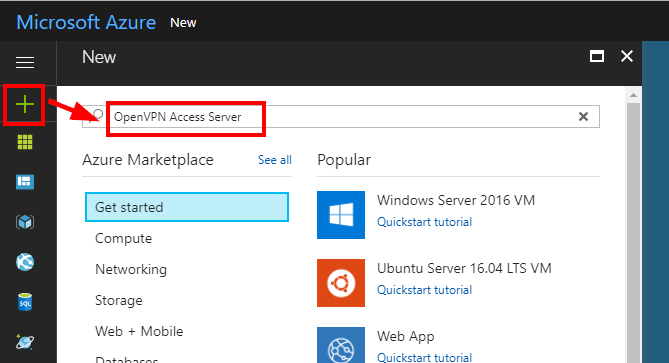 The Microsoft Azure BYOL instance is a 64-bit based VM that is based on Ubuntu LTS (Long Term Support) you can quickly launch on your Microsoft Azure account in order to get your VPN server up and running. To make it more convenient for you to deploy your server in the region closest to you, we currently offer the instance in all of Azure’s publicly available regions. The BYOL (Bring Your Own License) licensing model is one that relies on your purchasing a software license key separately from our openvpn.net website and activating it on your Access Server installations. This locks the key to the current hardware/software configuration on the instance in question. Making changes to the instance like imaging and relaunching it, or changing the instance type, or enabling autoscaling, will result in the license key becoming invalid, requiring you to contact us for support on this. See our troubleshooting page regarding BYOL type license keys for more information. It’s also important to note here that when you launch the BYOL type instance with the instructions given below, then you do not actually need to provide a license key. If you do not provide a license key, the Access Server goes into a type of demonstration mode where all functions are available without time limit, but only 2 simultaneous VPN connections can be made at a time. To unlock more connections, you need to purchase and activate a license key on your Access Server installation. Select the OpenVPN Access Server listing that appears, and click the Create button to start the instance creation process. 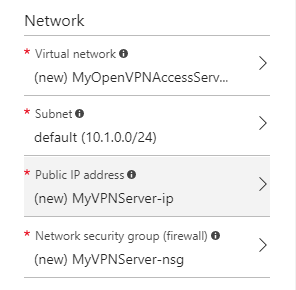 Name: Enter the name of your VPN server for identification purposes (this is only used on the Azure portal only). VM disk type: For recommended instance types, you will need to select HDD as type as the recommended instance sizes are incompatible with the SSD (Premium) disks. User name: Enter the username you would like to use to connect to your VM. This username would be used for SSH access to your VM only and would be separate from your VPN server admin credentials. SSH public key / Password: We recommend that you use SSH public key authentication if you already have a public key generated from a tool like ssh-keygen or PuTTYgen. If you do not have this information already generated, select Password to use a secure password to connect to your instance using SSH. Similar to the User name field, this information only applies to SSH connectivity to the instance and will not have an impact on the VPN server itself. Note: You will want to make sure you note the credentials you define here since you will need to use this information to connect to the instance at a later step. Subscription: Select a subscription you would like to use for your VPN server. For assistance on Microsoft Azure subscriptions, please contact Microsoft directly for help. Resource Group: Use the Create new option if you are starting a VPN network from scratch. 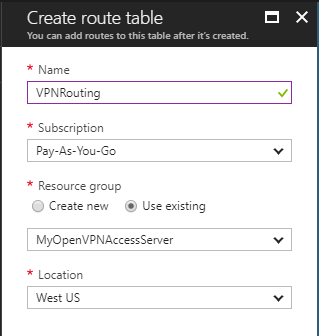 If you already have a local network on Azure you would like to interface with, use the Use existing option in order to position the VPN server accordingly on the network. Location: Select the appropriate location for your VPN server, if applicable. After all of the requested information is filled out, click OK to continue with the resource manager wizard. The recommended sizes would then be displayed. Select one of the recommended sizes based on your needs, and then click Select on the bottom of the screen. If you have special needs for the VPN server, you can also click the View all link to view all the possible instance sizes for this VM. It is not necessary to make this change unless you have special needs on the server or otherwise directed by support. Virtual network: This should be pointed to a virtual network (Vnet) containing the computing resources you would like your VPN clients to have access to. Subnet: This should be pointed to a subnet within the previously selected Vnet. Please note that while you are free to assign a different subnet to the VPN server, the VPN clients will not be able to assume addresses within this subnet due to Layer 3 routing. For this reason, it is recommended that you use the same subnet as the rest of the computing resources you intend to connect to with your VPN server. Public IP address: It’s recommended that you use a Static IP allocation rather than a dynamic IP allocation, especially if you are planning to get a commercial SSL certificate that would be valid for your VPN administration portal. Selecting a static IP allocation also makes it easier for you to point your DNS records to the correct IP address if you are going to be using a custom domain name or FQDN for your VPN server. Network security group (firewall): The rules have already been preconfigured for you so there is no need to create any additional rules in this section. You are welcome to make any adjustments here if necessary. After the desired settings are configured, click OK to continue with the wizard. Review the summary screen for your instance info, then click Purchase to initiate the instance on your Azure cloud. Please note that you will not be charged by Azure for the use of the VPN software. If you require a software license for your VPN server, please visit www.openvpn.net for pricing and additional information. If you do not provide a license key for your VPN server, your VPN server will run in a limited 2 user concurrency mode. The OpenVPN Access Server appliance is a Linux based appliance that is managed via an SSH connection. You can connect to the instance by using an SSH client using the credentials you have used previously to initiate the instance. 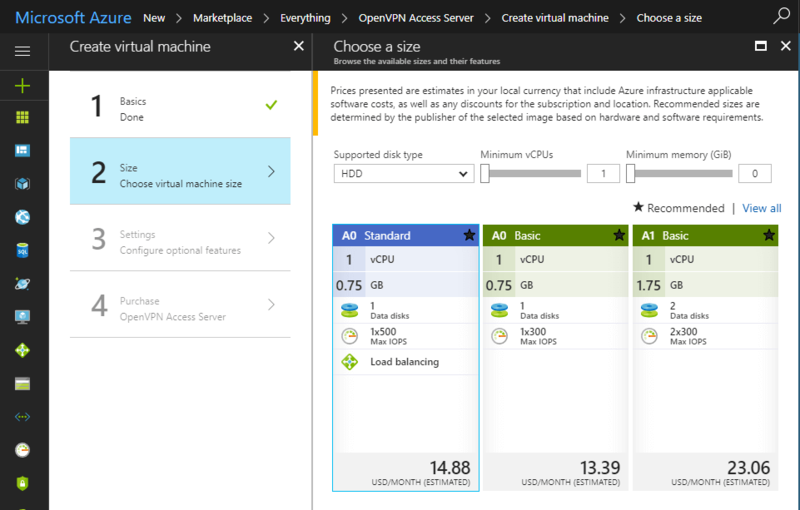 For more information on how to connect to your instance using SSH, please review the Microsoft Azure documentation available here. Tip: The IP address of your VPN server can be found under the virtual machine dashboard under the section: Public IP address. Note: You will need to complete this setup wizard before your VPN server will become operational. The OpenVPN Access Server Setup Wizard runs automatically upon your initial login to the appliance. If you would like to run this wizard again in the future, issue the sudo ovpn-init command in the terminal. Note: You will be given a URL containing your internal Vnet IP address. This will not work unless you are accessing this URL from another instance inside the same Vnet. To access the administration UI from the Internet, replace the internal IP address with the public IP address of your instance. 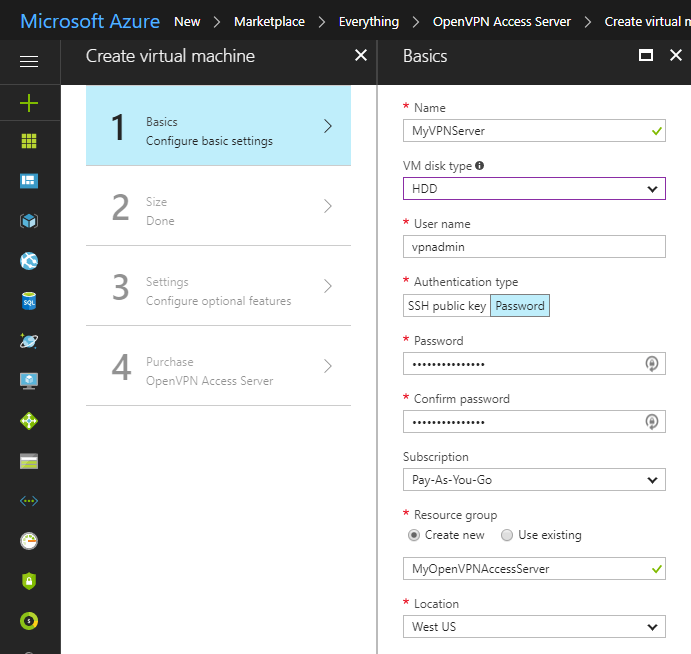 Since Microsoft Azure automatically uses an internal IP address for your instance, you will need to login to the Web Admin UI and configure the Hostname parameter manually (inside the Server Settings section). You may either use an IP address or a hostname here, although it is strongly recommended that you use a hostname since your clients will depend on this setting to be able to know where to connect to, and updating a DNS record is much easier than reinstalling all clients to update the IP address they need to connect to. Also, SSL certificates require a proper FQDN hostname in order to function properly. Tip: You may choose to configure an Azure supplied DNS hostname if you do not have a custom domain or FQDN. To do this, click the Configure link under the virtual machine instance properties below the DNS name heading. In order for your instance to function properly, IP forwarding will need to be turned on for your instance. You can do this by clicking on the instance on the Azure dashboard, then select Networking on the navigation bar. Note: You will want to note the Private IP address that is displayed here for the next configuration step of this guide. Afterward, click on the blue link right next to the text Network Interface. Select IP configurations from the newly created navigation bar, and click Enabled under IP forwarding to enable this option. Click Save to finalize the configuration. 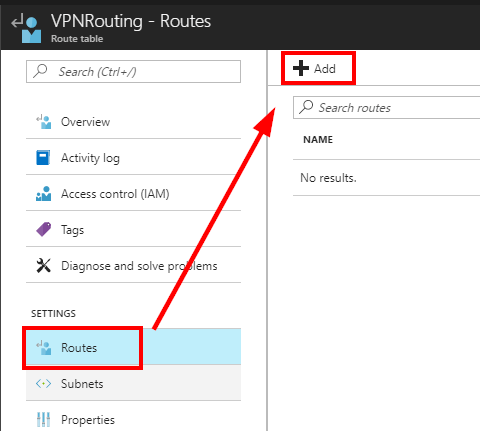 It is necessary to create a routing table on Azure so that traffic to your VPN subnet is directed back to your VPN instance. To do this, click the add button on the left-hand navigation bar and enter route table as the desired item. Select the Route table from Microsoft when prompted. Click Save when finished. Repeat this step for any additional subnets you may have under the same Vnet that the VPN server needs to communicate with. After the routing table is set, find the newly created routing table under the All resources button in the navigation bar, then select Routes in the new navigation bar that opens. Click Add to add a new route. Click Save to complete the routing table configuration. Warning: You will need to edit your routing table configuration if you decide to change your VPN subnets in the future in the administration UI of the VPN server.